home > topics > microsoft access / vba > questions > (complex) running totals in ms access 2003 query? 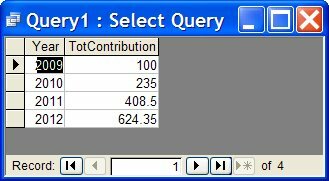 (Complex) Running Totals in MS Access 2003 Query? I’m having trouble using MS Access 2003 to accomplish something that I thought would be relatively easy: I’m trying to create a query [not a report] that will give me the projected balance of an account (such as a 401K account) at each year in the future, which is growing at a fixed rate of X% a year and which also gets additional, lump sum contributions each year. I’m not really an Access superhero nor SQL/VB guy, but after surfing the blogs, I have tried hacking around with Public Functions, Global Variables, DSUM, embedded Selects, etc., and I just haven’t been be able to figure out a solution [call me stupid!] Any help or advice would be severely appreciated! P.S. Like many things in Access, there's probably several ways to skin this cat - I just need one! I think I could pull it off if I could figure out how to embed and execute a SELECT statement within a Public Function, and assign the value to a variable within a DO...LOOP. But I'd take any other ideas too! I don't know for sure, but I think you could have a column in your query that is based on an expression, using the DSum function - DSum("contribution_amount", "contributions_table", "year <= year_field") where year_field is the year of the current row. This will aggregate (the D... functions are called domain aggregate functions) the contributions to the account for all years up to the year of the current row. So just write DSum(...) + starting_amount, which could be another field in the query. Ah, a nice interesting problem that fits nicely (if not necessarily obviously) into SQL. We will need to link it into itself and calculate the sum effect of each record, bearing in mind the delay in years, and incorporate that total into the main record. Amended SQL as I'd incorrectly multiplied the percentages (110%) instead of powering them. PS. Click on image for a clearer picture. Kudos for understanding it too. It's not enormous but it takes a little thinking to appreciate what it's doing, particularly to understand why it works when at first glance you would think it had not included all it needed to.